Pay once and never worry about it again. Once you buy the compiler you are entitled to lifetime free upgrades. Upgrading the compiler takes only a few minutes and a few clicks. We are constantly adding new features to the compiler, you can keep track of what is happening on the Software Roadmap page. Our support team is always available – you can rely on our help while you are developing. The compiler license guarantees free product lifetime technical support. mikroC offers a unique mechanism to easily use libraries in your project, just select the libraries you need and they will be instantly available in your code. No need for dozens of #include directives. You can also install and manage third-party libraries using our package manager and library manager. Simply select the libraries you need for your project, by checking the box. Or press the “Check All” button to include them all. 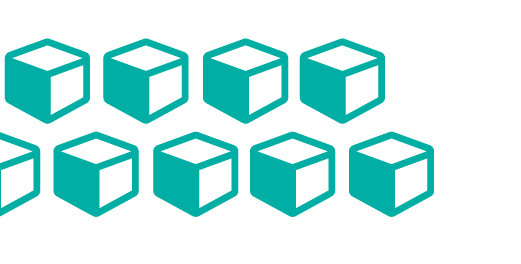 With more than 1200 library functions you’ll save time, effort and you’ll write better code. 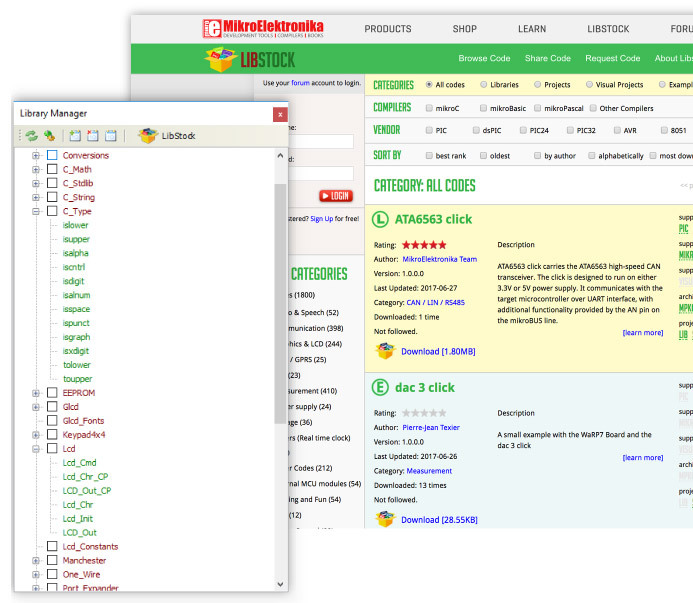 Visit LibStock and download fully functional and working projects, and install them with a single click. Every single library that is in our compiler is covered by a working example. More than 109 ready-made working examples, to help you understand how the library works or give you useful code snippets for your project. 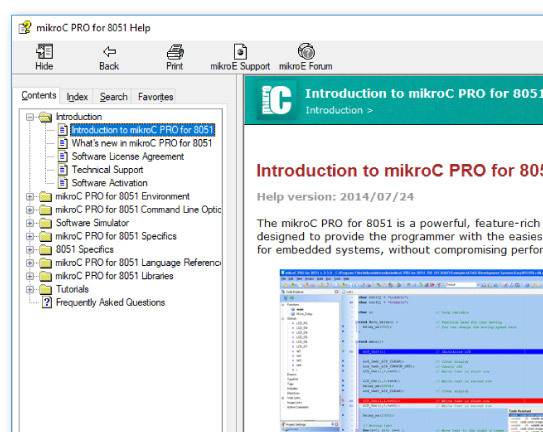 The mikroC PRO for 8051 currently supports 202 MCUs for 8051 and we are constantly adding new ones. 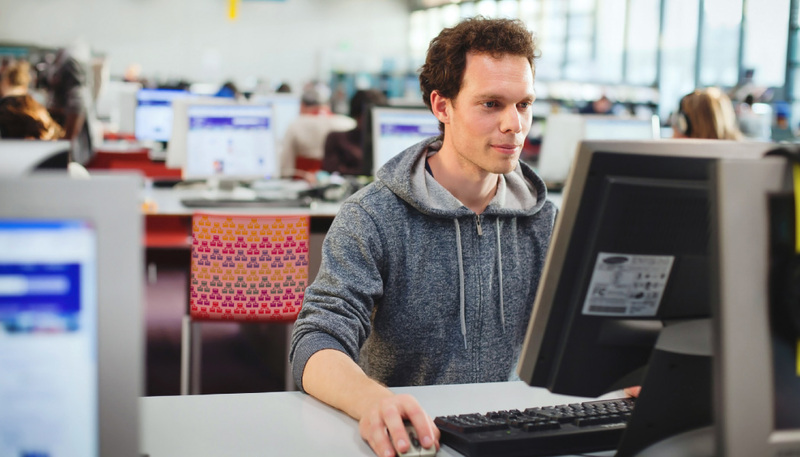 You can be part of the process by letting us know what microcontroller you wish to see supported next, by using our helpdesk and submitting a ticket. The ideal environment for you to write, compile, execute, and debug your code. All the tools you could think of, and more, are there. The Library Manager, Interrupt Assistant, Project Explorer, Quick Converter and more. Click here to get an in-depth explanation of each part of the IDE. 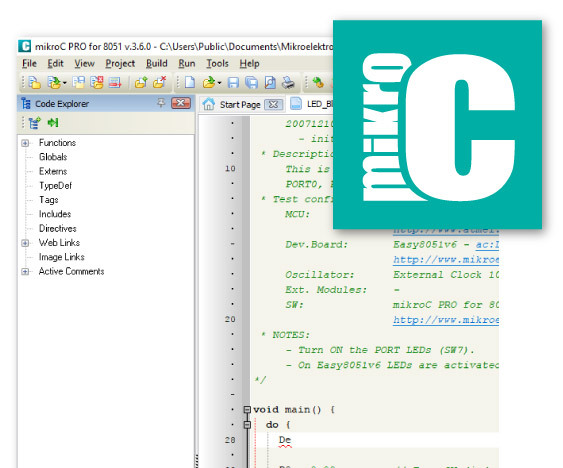 mikroC comes equipped with fully-functional software tools that can boost your efficiency and do the job for you, so you can be more productive in your work: LCD Custom Character Tool, GLCD Bitmap Editor, Seven Segment Editor, UART Terminal, UDP Terminal, HID Terminal, ASCII Chart, Active Comments Editor, Interrupt Assistant, Advanced Statistics and much, much more. The help file is the best place to start if you want to get to know the compiler. The easy-to-read format and detailed explanations of every functionality and feature will make you an expert in no time. Buy the compiler and the License Code will be sent to your inbox instantly. Once you activate the license you can use it on up to two computers. 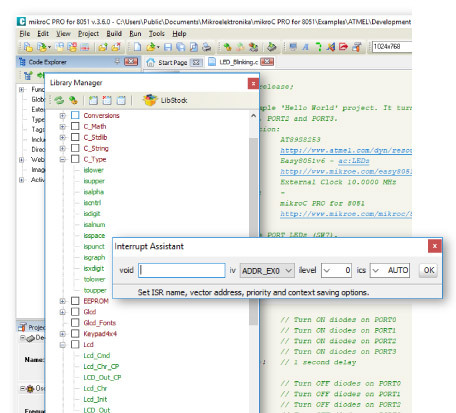 Code, compile, program, and debug – all in one environment. Choose the development board, and you’ll soon see that the rest of the tools are perfectly arranged around it. mikroLab contains everything a developer needs to explore the possibilities of the microcontroller architectures we offer: a development board (with integrated programmer and debugger), the compiler license, an assortment of accessories, and as a bonus, a free license for one of our GUI design tools (either Visual TFT or Visual GLCD). Control-space is probably the most widely used shortcut among programmers. Why? Because it initiates Code Assistant - programmer’s first aid kit. No one needs to memorize function names. Focus on your code, and let the syntax write itself correctly. Write function calls with one click of your keyboard. 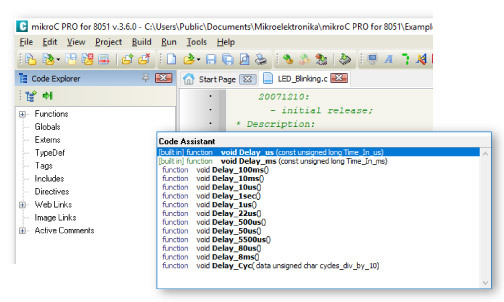 Code assistant in mikroC PRO for AVR also suggests correct names of constants, URLs, Active comments and variables, so you have it all covered. You don’t ever have to get another Syntax error message. 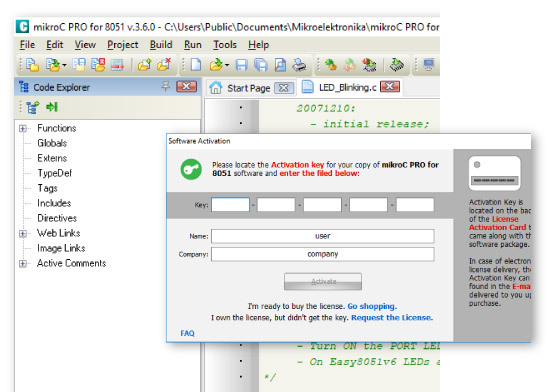 We have developed Active Comments - a unique feature of mikroC PRO for AVR. Any comment can become your multimedia event hook. Add images, files and URLs to any active comment and assign events as you like. Right Mouse Click can open browser with URL, Mouse Over can display the image, and Double Click can open a specified file. The compiler also includes the Interrupt Assistant, that can help you in configuring interrupts. You can launch it from the drop-down menu Tools › Interrupt Assistant. Many functions. Even more parameters. Was it word, or byte? You don’t have to scroll through Help file. Just hit CTRL+SHIFT+SPACE and function parameters will be listed for you. When your code overgrows the size of your screen, it’s always better to fold those completed blocks, and work in a clearer surrounding. This way you can always see the big picture. What’s the point of a compiler if you have to do all the hard work yourself. 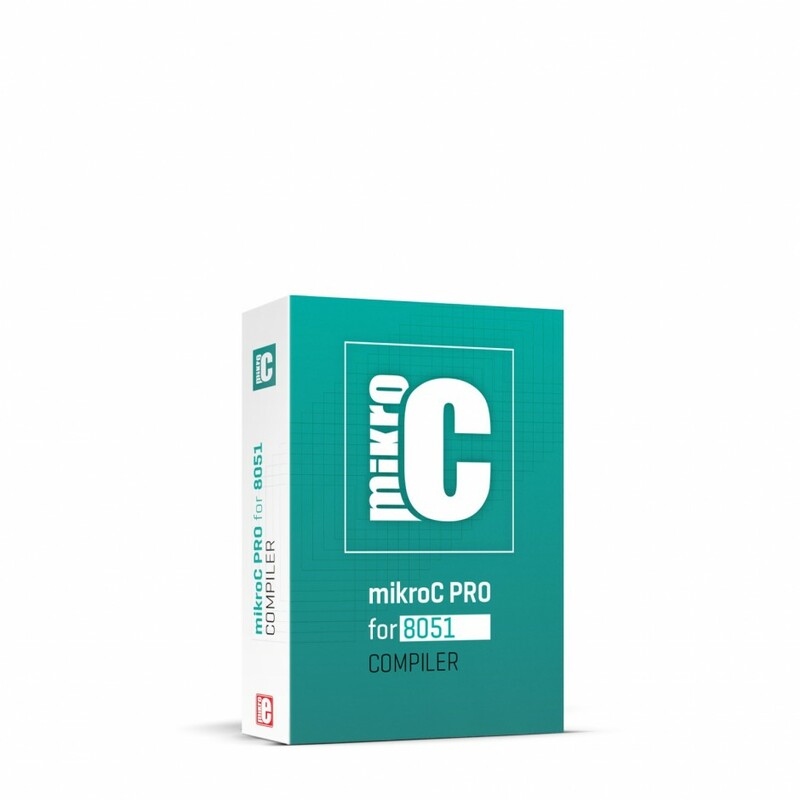 mikroC PRO for AVR offers you several most useful integrated tools that will help you get the job done with minimum effort. Your fast pocket converter of binary, float, HEX and Radix 1.15 formats into formats you need in your code. It even displays ASCII values of your bytes. 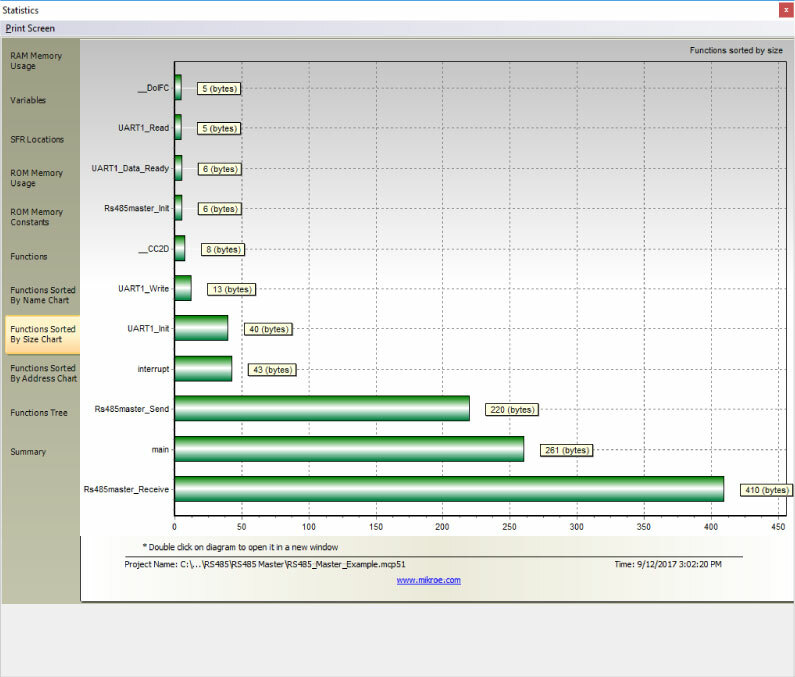 If you want to go through your code and monitor the values of your variables searching for bugs and errors, Software Simulator is the best way to do so. 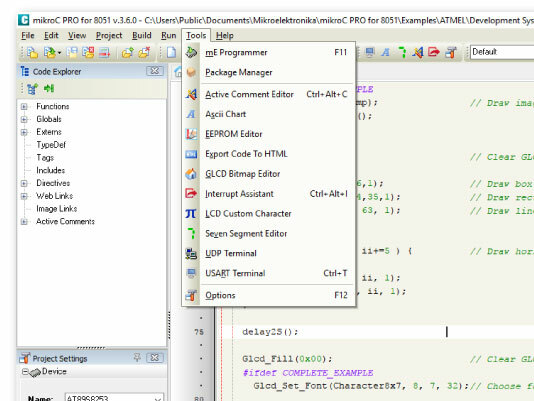 Software simulator supports all debugging modes as hardware debugger, but instead of executing the code on real hardware, it simulates code flow on your PC. 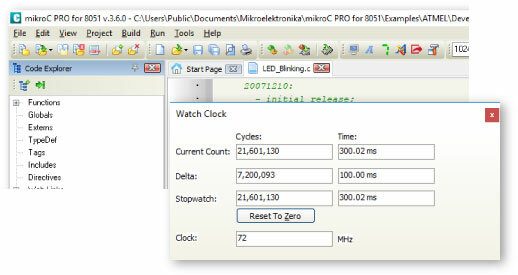 Using Watch Clock you can precisely measure the code execution time in microseconds or in clock cycles. After you build your project, you can always look under the hood with mikroC’s Advanced Statistics. It is a powerful tool that visually describes most important information about your project. Take a look at your variables, arrays and constants and know how much memory your program consumes. See which function calls which in the functions tree window. See how big are your functions and how are they linked in memory, which is especially important if you want to write your own bootloader applications. Further details will be revealed as the project develops. Make sure you have the latest version of the 8051 compilers while you wait for the new one. License owners are entitled to a lifetime of free upgrades. Just update your compiler and you will feel like getting into a shiny new car. There are over 35 new features, and 110 improvements. We have supported 17 new C8051F3XX and C8051F5XX microcontrollers from Sillicon Labs©. New Activation and Registration keys are quick and elegant solution for unlocking the Demo limit and registering your license. Waiting is over. With newly integrated Live Update tool you can receive new features and improvements instantly! Fixed: Const Folding of ternary operator. Fixed: Handling of void in expressions. Fixed: Problems with large model. New! Added shortcut button for Package examples. New! Pointer handling in watch window shows data it points to. New! Function pointers show the name of the function currently pointing at. New! Value hint in debug mode for pointers shows data it points to. New! Code assistant (CTRL+SPACE) for pointer to structures. New! Update Project Manager after cleaning project files using ClearProject. New! Double Click on bookmark in Bookmark editor opens file and positioniing on line where bookmark is placed. New! Remove all breakpoints option implemented. New! Added option to reload project file which has been externaly changed. New! Breakpoints are now saved to file. New! Breakpoints are loaded when opening file. New! Double click on break point in breakpoint's list opens editor and set cursor on line with breakpoint. New! Delete one breakpoint from breakpoint list is posible now. Improved Bookmark Editor. You can now view bookmark IDs. Improved Bookmark Editor. You can now see all files in project containing any bookmark. Improved New Project wizard (project folder selection, existing project files added to list). Reduced number of steps for creating new project. File name and file path now separated. Improved Library manager. Faster loading of libraries. Improved Search project files in Windows Explorer style. Improved Add project to project group by single mouse click. Improved Statistics is no longer a "modal" window, but rather "stay on top"
Fixed: Issue with setting MCU frequency. Fixed: Creating project with empty name. Fixed: Creating project which name which starts with a digit. Fixed: "File Save As", "Project Save As" and "Save Project Group" give wrong file filters. Fixed: Active comment starts with a digit caused IDE to crash. Fixed: It is not possible to save a project group when projects were added from Project Explorer. Fixed: Statistics window did not always stayed on top. Fixed: In debug mode changing focus between editor and watch list was not momental (Insert, Delete key...). Fixed: Closing file while compile is in progress caused IDE to crash. Fixed: Search paths was not refreshed on starting IDE if "Search Path" window was opened when IDE was closed. Fixed: Removed space characters in front of line code When a bookmarked line is displayed in bookmark window. Fixed: Project settings schemes, some schemes were outdated. Fixed: Remove recent project from Start Page caused exception. Fixed: Code explorer, when undocked worked incorrectly. Fixed: Progress Bar window did not have border. Fixed: Undo command in editor doesn't return to saved state of file. Fixed: Multiple row word-by-word selection. Fixed: A lot of Search/Replace quirks and bugs. Fixed: Loosing all breakpoints when closing editor. New! 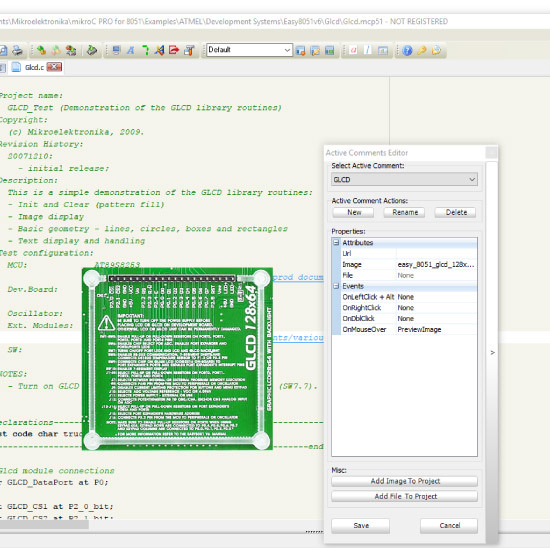 Added examples for BIG8051 development system. Improved: Help revised and updateddel. 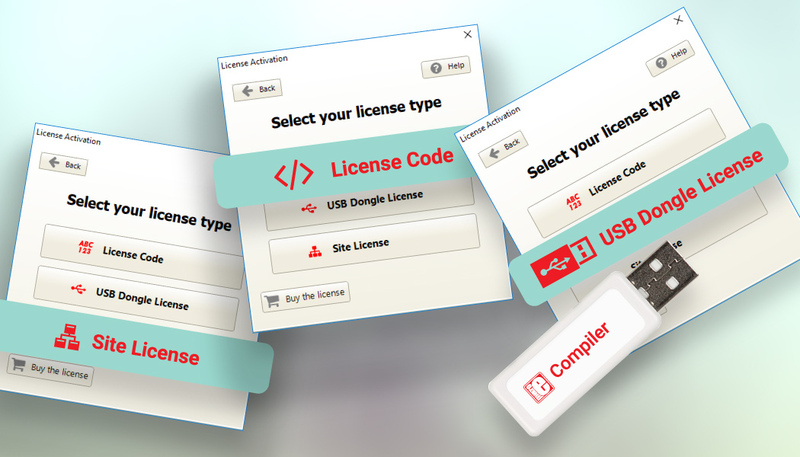 Choose this licensing option if you want to activate your compiler license in seconds. You can use it on up to two computers. We will send you the Registration code as soon as you purchase the compiler, which you will use to request the Activation code. That is the whole process - your compiler license is activated. It’s the quick and straightforward licensing option for this fast-paced world. Plug the USB Dongle into your computer and activate the license. Use your compiler license anywhere. If you are looking for a portable license that can be used on different computers the USB Dongle license is what you need. The USB Dongle contains a single license, it registers the compiler while it's connected. So, carry it anywhere with you. You will not be tied to one computer or one office. Affordable: Instead of buying multiple licenses at regular price, we will quote a special discounted price. Schools and universities will get the best deals. Flexible: With the Site license, individual licenses are not tied to individual computers/users. In other words, you don’t have to buy a compiler license for each person who will use it. The number of licenses you own only defines how many compiler copies can be in active use at the same time. You control who has access. Once you purchase a given number of compilers, we will send you the installation for the Site License Manager (available for Windows and Linux). It’s an application that runs a server from your computer. To activate their compiler, members of your class/team connect to the server by entering the IP address and PORT number you gave them. Clicking on Submit will open a Support Ticket which will be assigned to the person who can best deal with the issue in question. You will immediately receive an automated response message and will be able to monitor communication thread through our Support Center.